Welcome! I swear, I seem to go in spurts where I get posts up on time and then I always have one that I forget. Today was that post. 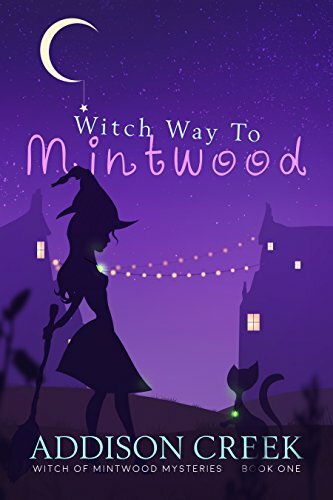 Anyway, today I’m hosting a stop for the Great Escapes Virtual Book Tour for Witch Way to Mintwood by Addison Creek. One of Ms. Creek’s characters has stopped by today to visit with us! More information about the book and the author will be beneath the character’s guest post! Hello! I’m Lemmi, or Lemonia if you’re my least favorite aunt. I’m the Witch of Mintwood, Maine, and I’m here to tell you what that’s like. Maine is a big state with only a few people in it. Mintwood has four thousand of them, and I live on an old farm with plenty of space. The only trouble is that townsfolk before me somehow managed to build the farm on a graveyard. I probably wouldn’t even know this, except that as a witch I can see and speak with ghosts. My farmhouse is occupied by the tea lady ghosts, the former mayor ghost, and a ghost named Mr. Bone, but that’s to ignore the most important ghost, the cat Paws. We all get along just fine as long as everyone does what Paws wants at all times. Most of my job as the Witch of Mintwood involves investigating murders, helped by my ability to see and talk to the ghosts of the victims. My two friends Greer and Charlie, who are also my roommates, help me out. Somehow there’s always a ghost around of someone who’s been murdered, but tensions in Mintwood don’t just come from ghostly sources. There’s also Jasper Wolf of the Wolf Corporation to consider. He’s a dreamboat in a corporate greed sort of way. I’ve loved him since high school. Unfortunately, now that I’m the Witch of Mintwood, my life doesn’t exactly scream cool and fast track. It’s more like the falling down porch, mouthy ghost cat, outspoken friends, and ratty hair track. Come join the fun! If you need me I’ll be investigating a murder or refereeing a fight between loved ones. Just a normal day in a witchy small town! House falling down? Check. Pet sitting job with annoying clients? Check. Ability to speak to ghosts, which has the unfortunate side effect of having to listen to what they say back? Double check! Hot high school crush still in town being all successful and stuff while you protest his building projects? All kinds of checks! Did anyone say Witch of Mintwood? Yup! Just add murder and this will be a week to remember! Reading, writing, dark chocolate, and cheese. Hello! 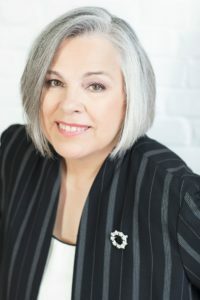 I’m the author of the Witch Way to Mintwood series and the Spooky Business series! I live in New England and love it. I survive the winter by layering, good-natured complaining, and more layering. In case you were wondering. Hearing from readers is always lovely, so come visit me here me on my blog or Facebook. Thanks for joining me today! If you’re interested in visiting other stops on the tour, please click the banner below! Welcome! Today I’m hosting a stop on the Great Escapes Virtual Book Tour for Plum Tea Crazy, a Tea Shop Mystery by Laura Childs. I love this series so I was excited to be able to read and review this newest installment. Before we get to my review, I’m happy to say that we have a guest post from Laura Childs herself to enjoy! Thank you to Ms. Childs for being willing to write a guest post for my blog! 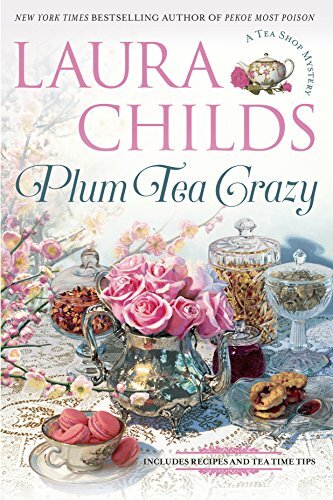 A Q&A with Laura Childs, New York Times Bestselling Author of Plum Tea Crazy. When you write, Laura, do you normally have an idea several months ahead of time or do stories just come to you as you’re writing? The answer to both those questions is yes. I usually have three or four plot ideas pin-balling around in my head, so I start to work them up and then pick the one I like best. The other ideas are always kept in reserve so I can circle back to them at a later date and flesh them out for the next few books. Since I spent 20 years heading my own advertising agency, I’m lucky that I developed a knack for being “creative on demand,” with ideas coming fairly easy to me. As you decide on characters, is there something that calls out to you? Characters in my mysteries are either protagonists or antagonists. That is, they are either the hero or a suspected villain. That means my stories need to include a roster of suspicious characters that keep my readers guessing and turning the pages fairly quickly. I also strive to create suspects that are flamboyant and fairly dysfunctional. In Plum Tea Crazy, for example, I’ve got a snarky banker, goofball handyman, shopaholic ex-wife, and a slicko stalker attorney. There are a few other crazies tossed in for good measure, too. Are your mysteries based on real life surroundings? Since the Tea Shop Mysteries all take place in Charleston, SC, I try to create a very careful sense of place right down to the last cobblestone. Do you feel that damp fog as it rolls in off the Atlantic? Can you hear the mournful toot from the lighthouse over on Patriot’s Point? Is someone sneaking up behind you in Dueler’s Alley? Charleston is one of those cities that is eccentric and highly atmospheric – old mansions, live oaks dripping with Spanish moss, fog-shrouded bayous. Those are all very real elements and I try my best to sprinkle them throughout my mysteries. For Plum Tea Crazy was there something you really wanted readers to come away with . . . as in a different outlook on life? I always try to make the point that my main character, Theodosia, is extremely independent and entrepreneurial. When I was in marketing, I ran into dozens of women who longed for more focus and control in their work lives. These were smart women – ad managers, product managers, administrators, etc. – who wanted to flee corporate life to open a tea shop, needle craft store, or antique shop. I think most women are natural born entrepreneurs. They don’t always want to build a Fortune 500 company but they do want an environment that is nourishing and rewarding. Tell us a little bit about Plum Tea Crazy. Thank you and hugs to everyone! Thank you again to Ms. Childs for writing a guest post for today! This newest installment in the Tea Shop Mystery series from Laura Childs is just as wonderful as the others have been! I love the cast of characters in this series. Honestly, if I didn’t, I wouldn’t still be reading the series. Characters are far more important to me than the plot line. I can put up with pretty abysmal plot lines (which this is NOT one of those books – this plot line was excellent) if the characters are awesome. I’ve always enjoyed Theodosia, Drayton, Haley, Detective Tidwell and the rest. It’s fun to come back each spring to another visit into their world! These are well-rounded, complex, developed characters and they’re delightful. The plot line in this one was excellent. There were enough suspects that it was hard to know who was the true villain. I did guess correctly, but it would have been very easy for me to be side-tracked by one of the other options. There was just something about the villain character that seemed “off” about them. That’s all I’m going to say so I don’t give anything away though! If you haven’t read the series before, you could certainly start with this one as each mystery is its own story, but I would recommend starting at the beginning of the series with Death by Darjeeling. There are backstory things that will make more sense if you start the series at the beginning. Either way, pick up Plum Tea Crazy and enjoy the newest installment in this great series! Thank you for joining me today! If you wish to visit other sites on the tour, please click on the banner below. It will take you to the main tour page where there is a list of tour participants. Welcome! 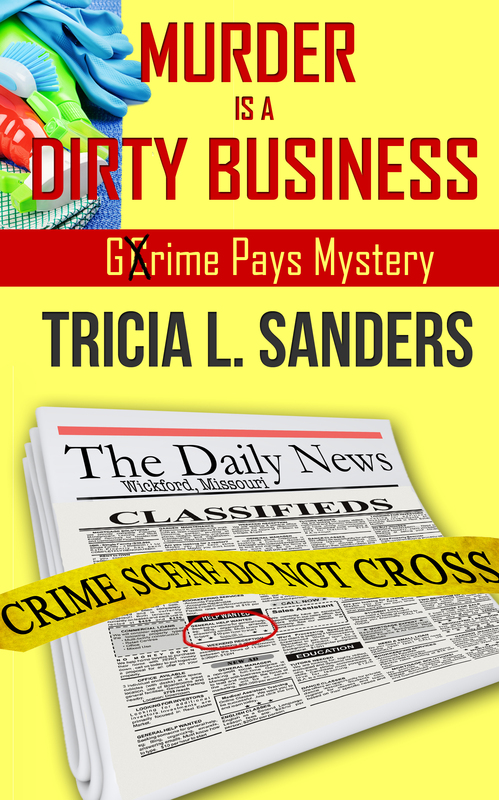 Today I’m featuring a stop on the Great Escapes Virtual Book Tour for Murder is a Dirty Business, the first in the new A Grime Pays series by Tricia L. Sanders. Ms. Sanders has graciously provided a guest post for today. Information about the book, including purchase links and a Rafflecopter Giveaway are below the guest post! Enjoy! Hi and thanks for having me. I’m kicking off 2018 with a recommitment to my passions. I’m identifying my goals and finding ways to make them happen. My evenings have always been about the R’s: relaxing, rejuvenating, and re-grouping. Basically, sitting around the house and getting some much-needed rest. After the hustle-bustle of the day, I deserved it. On most evenings you could find me curled up with a book on the craft of writing or the latest list of upcoming conferences and a steaming cup of Earl Grey. Each new year my resolution was the same, write my novel. My goal was to get those pesky characters out of my head and onto a page. However, I wasn’t working toward my goal. One good writing book would give way to another and another and another. Rationalizing the need to study up on dialogue, I’d rush out and find a book on creating engaging dialogue. When I turned to the last page, I’d be giddy with excitement. Now I knew how my characters should converse. But what if my plot stalled, or my protagonist was weak, or my pacing was off? Get the drift. My shelves overflowed with writing books, but not one novel in my bookcase with my name on it. Then one November, I accepted a challenge along with a few members of my critique group—write 50,000 words in a month. I knew 50,000 words did not a novel make, but it was a darn good start. On the surface it sounded easy—simply write a little over 1600 words per day for thirty days. I could whip out a 2000-word essay in no time flat, so that should be easy. Right? Oh, boy! Talk about the need for willpower. Before I began, I made a schedule of writing times, keeping in mind the Thanksgiving holiday. I taped a huge sign over my computer that said, “NOVEL OR BUST.” I told everyone I knew about my mission—nothing like adding a little peer pressure. Every night after supper, I eyed my comfortable chair and the writing book du jour, but instead raced up the stairs to work on my novel. And you know what? I did it. On the last day of November at 6:01 p.m., I reached my goal. My novel consisted of 50,003 words. Was it complete? No, but it had a beginning, a middle and an end. Had I given up my “R” evenings? No, I still had work to do, but instead of relaxing, I revised. Instead of rejuvenating, I re-wrote. And in the end, re-grouping gave way to rejoicing! My dream of publication came true in November of 2017. I haven’t stopped reading my books on the craft of writing or attending workshops and conferences, but I put my passion first. A wise friend once asked me, “If it doesn’t pertain to your passion, why are you doing it?” I ask myself that all the time and it has become my mantra. The best way to keep my passion in mind, is to display it prominently in my office, on the screen saver of my laptop, phone, and tablet, and with a sticky note on my mirror and on the fridge. When I find myself procrastinating, I only need look at my passion to get me back on track. I challenge each of you to work toward your passion this year, whether it’s writing, painting, organizing your life, or traveling. Is this the year your dream comes true? My 2018 goals are to continue marketing my 2017 novel, publish my second novel, travel, and attend my first RWA conference. When I find myself cleaning out a closet, or lollygagging on the sofa, I ask myself if this is helping me achieve my goal. Define it and live it. I hope 2018 brings great rewards for you. Thanks for joining me on this Great Escapes Virtual Book Tour! If you wish to visit other sites on the tour, please click on the banner below which will take you to the main tour page which has a list of participants! Greetings! 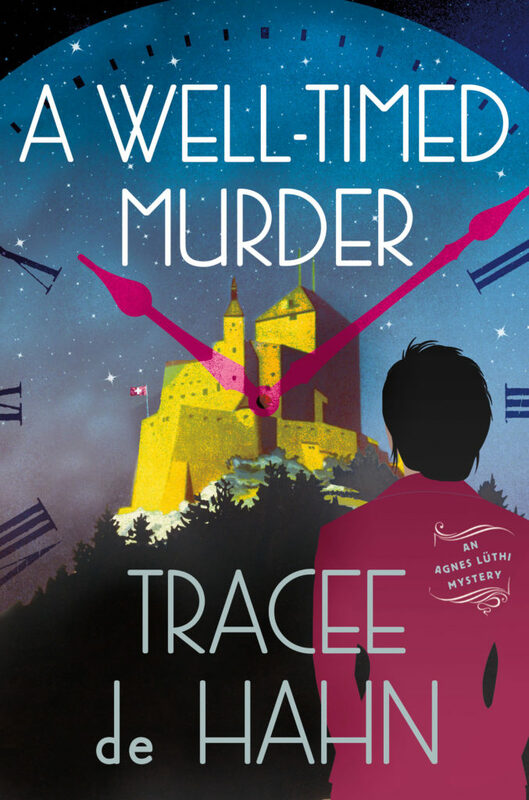 Today’s Great Escapes Virtual Book Tour is for A Well-Timed Murder by Tracee de Hahn. Ms. de Hahn has provided a guest post for today’s post. Purchase links and a synopsis of the book will be below the guest post. Would you kill for a watch? That’s what was on my mind when I began research for the next Agnes Lüthi mystery, A Well-Timed Murder. To immerse myself in the world of watches I decided to visit Baselworld, the world’s premier watch, jewelry and gemstone show. An annual occurrence in Basel, Switzerland it is the perfect setting to test the lure of luxury timepieces. What I discovered, is that you don’t have to collect jewelry or watches to enjoy Baselworld. What’s the scientific basis for this statement? I took a friend along on my research trip, a friend, who we will call JSP, who is a definite foil to my attraction to all things glittery. An architect, JSP embraced the journey as an excuse to visit the buildings designed by the famous Swiss architecture firm Herzog & de Meuron. This was perfect. I wanted to note the impact the show had on a visitor with no interest in the merchandise. The day started off perfectly. The spring weather was clear, the crowd gathering under the expansive canopy at Baselworld was restrained but excited. For JSP, the main expo building lived up to its reputation. The exterior walls are textured aluminum, creating the impression of a woven façade. The entrance canopy reaches across the street, sheltering a restaurant, flower stall and other activities. Happy people were heading to the expo doors with money to burn. JSP entered the exhibition with a smile on her face. I thought her initial attitude would buy me a few hours of interest on her part. Five minutes later I knew that I’d made a mistake. She might not want to leave. It is impossible to ignore the effort that goes into making Baselworld an incredible experience. The ‘pavilions’ (showrooms) would be at home on any high fashion street in the world. However, it is the product that steals the show. JSP kept me focused on my research. We studied overhead walkways, examined isolated bathrooms, and spent enough time in back corridors to likely warrant extra scrutiny on security cameras. This is the fun part of research – imagining what could happen. Luxury automobiles lined up between two halls: Inspiration! At the end of the day, JSP and I left without purchasing any watches or gemstones. But we did have a greater appreciation for the entire industry. To the casual observer, watches are objects of beauty. However, behind that beauty is science and technology. Which metal to use? How to form it, make it stronger, more pliable, more rigid? Watchmakers are constantly pushing the envelope: lightweight, shock resistant, accurate. And, of course, there is beauty. I spent a long time hovering over the work space of a master engraver at Blancpain, watching him etch the back of a watch with a tiny, highly detailed, animal scene. Pure artistry. In the book, Agnes shares my experience and more. She also sees the behind-the-scenes competitiveness of the industry. How much is at stake and how much people are willing to sacrifice to stay on top. Murder comes to mind. Thanks for joining me today! If you wish to visit other sites on the tour, please click on the banner below to visit the main tour page! Welcome to another day and another tour! I love doing these Great Escapes Virtual Book Tours! They expose me to great authors and new series. 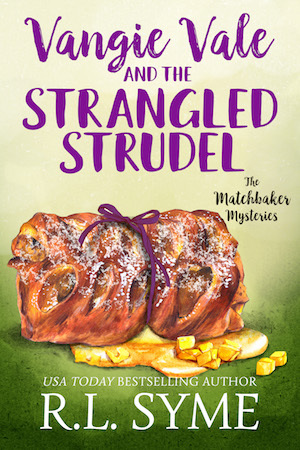 Today’s tour is for Vangie Vale and the Strangled Strudel, the third book in the The Matchbaker Mysteries by R.L. Syme. I had mixed feelings about this book, which I’ll share below the guest post that R. L. Syme generously provided me! Enjoy! On Facebook, I have a wonderful group of Vangie’s friends who all congregate with me to talk about the books and our lives. We occasionally talk about Vangie, and as I was preparing for this book tour, I asked them if they had any topics for me to talk about in my guest posts. I borrowed some of their questions to write about. Here are some of the ones they posted. * Why can’t Vangie and the sheriff get along…? I wondered if this would be a popular question, among the fans of the books. Vangie and Malcolm have sort of a love/hate relationship in the first three books, but there are definitely a swath of fans who are rooting for them to get past their differences and start a romantic relationship. And I don’t blame them one bit. Malcolm is a hottie. But of course, so is Derek. Her current boyfriend. But let me take a serious stab at answering this question. I want to be honest in that Malcolm’s issues are just as much at play here as Vangie’s. In fact, maybe even more so. I think Vangie is curious about her neighbor, the Sheriff, and she finds him interesting. She finally feels like they are friends. But Malcolm is not a church guy, and he specifically has issues with pastors. You’ll find out more about those issues later. For Vangie’s part, though, she’s dating Derek. * Where did she get her quirky charm? That is a great question. I feel like it’s a combination of using sarcasm to deal with the difficult things in her life, and her personality making her different. She has a quick mind, too, so she does find herself speaking quickly, because she’s thinking quickly. That’s probably what I would attribute it to. * What was her relationship with her mother like? This is a great question. She lost her mother when she was a teenager, so she did have several years with her. But she had a solid relationship with her mom. She and Priscilla were both close with their mother, and it was part of what made the girls so close as they got older. She’s not very close with Laura—the woman her father married a few years after her mother died—and she doesn’t consider Laura to really be her stepmother, since Laura didn’t really raise her. But she’s glad her dad is happy. These were great questions. It was a lot of fun seeing what Vangie’s fans wanted to know about her. Thank you to R.L. Syme for providing me with the guest post for today! Here’s information about the book followed by my review! You could call it the straw that broke the camel’s back but it was more like a Montana forest timber. Just when Vangie Vale’s life was getting back to normal after a murder that rocked her little Rocky Mountain tourist town, she found herself in the middle of another murder… as the chief suspect. Vangie stood shocked on the side of the curb as the sheriff stretched yellow crime scene tape around the front of her new bakery. Wouldn’t this make a lovely headline in next week’s paper: Local Baker Kills Parishioner With Pudding. Vangie’s road back to good graces as a part-time pastor was bumpy enough already. This would be a roadblock. Can’t have that. As I said above, I had mixed feelings about this book. I like Vangie as a character. I like Derek and I really love Malcolm. But Vangie’s tendency to be impulsive and not THINK when she goes to investigate drives me batty. I’ve read through all three books in this series hoping that over time she’d learn to at least stop to THINK before she rushes headfirst into danger, but so far she hasn’t. The book is well-written and the plot line was great. I had no real ideas about who had done the crime until it was revealed at the end. Ms. Syme did a really great job with the villain. I don’t want to give anything away, but it’s not easy to write the type of villain that she had in this story and Ms. Syme did a fantastic job with it. I haven’t decided if I’m going to continue with the series at this point. But I don’t want to dissuade my readers from it because it IS well-written and the characters are great. I just hate heroines who don’t think before rushing into danger. That’s my personal preference and has no bearing on my rating of the writing. If that type of heroine doesn’t bother you, then I recommend this series highly!